Peanut butter has many statistics associated with it that show how powerful this nut is. It has tons of protein power per gram, with healthy fats thrown in. It’s not nearly as unhealthy as people sometimes are led to believe and it can prove to be a powerful additive when it comes to shakes, slices of bread, and straight up spoonfuls. The National Peanut Board reports that it takes about 540 peanuts to make a 12-ounce jar of peanut butter. There are no GMO peanuts on the market. In fact, today’s peanut is 99.9% identical to its ancestors. According to FDA regulations, for peanut butter to be labeled as such, it has to contain at least 90% peanuts. Global peanut production totals about 29 million metric tons per year. The average American eats more than six pounds of peanut products each year. Each one-ounce serving of peanuts contains seven grams of protein. So what does peanut butter have in it that makes it so powerful? There are two components that make peanut butter great: the protein and the healthy fats. 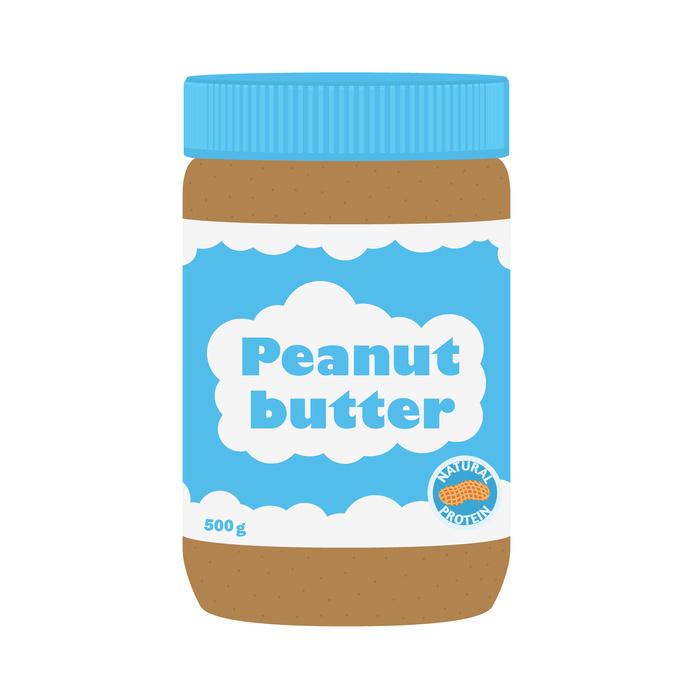 Peanut butter, as in the statistics above, has seven grams per one ounce of protein. One ounce of protein is the equivalent of around one tablespoon. That’s how much it takes to get a good percentage towards the standard amount of protein per day as categorized by the Food and Drug administration. The protein in peanut butter has staying power. It can go to replenish muscles after a long workout. It can go to repair muscles after a muscle building session. It can go to keeping muscles strong, by reforming the fibers in the muscles after a workout. For those who are not familiar with weights, it’s the resting period where muscles are built. Peanut butter goes to support that. Peanut butter also has healthy fats, which is different than the kinds of fats people will see in processed food or meat that is fatty. Healthy fats are the kinds that people get from nuts: almonds, walnuts, pecans, and peanuts. Healthy fats can also be found in avocados and other sources aside from meat. The healthy fats in peanut butter go to support numerous functions in the body. There are nerve endings that need healthy fat to send signals to the brain. There are receptors in the brain that need healthy fats to work correctly. There are parts of the body that need healthy fats. Fat has become a negative word. Healthy fats are just that: healthy. The healthiest nuts all include the healthy fats. The healthiest nuts are almonds, walnuts, pecans, and peanuts. All of these contain a high degree of healthy fat along with a high degree of protein. They contain little to no carbs, which make them perfect for a ketogenic or low-carb diet. When thinking about the healthiest nuts, always contrast the amount of protein with the amount of fat. Look at the saturated fat content. The healthiest nuts have a better ratio of protein to saturated fat. The higher the protein, the better. The lower the saturated fat, the better. A good ratio is key. When thinking about protein, know the following terms: peanut nutrients, peanut nutritional value, peanut oil, peanut oil uses, peanut snacks, peanut protein powder, peanut butter benefits, peanut allergy, peanut calories, peanut cholesterol percentage, peanut products list. Finding the right mix between protein and healthy fats is part of the issue when dealing with high fat but nutritionally dense foods like nuts and avocados. While healthy fats are healthy, many diets promote a lower ratio of fat compared to the other macro-nutrients like carbohydrates and protein. There are others that don’t, the ketogenic diet notably.